Puppet Heap: Anybody Need a Pet Monster? Anybody Need a Pet Monster? Now, you can make your own! Puppet Heap's very own Diana Schoenbrun can show you how. 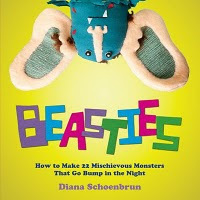 This week, Diana has released her new book, BEASTIES: How to Make 22 Mischievous Monsters That Go Bump In The Night. The creatures, designed by Diana, were photographed by Tory Williams and can be brought to life with the magic of scrap fabric and thread. There will be a release party on Thursday evening from 7-9, featuring live music, drinks, snacks, a presentation, and discussion. Click here for more information. That's a great idea. Congratulations! My daughter would love that book! I can vouch for it -- I bought a copy and my little niece is dying to make [or have me make] her at least 3 of the creatures inside.